Author A. A. Milne is inspired by his son, Christopher Robin, to write the world famous children's book Winnie the Pooh, but the fame that comes with it may wind up ruining his son's life. Sometimes stories are better left untold. "Goodbye Christopher Robin" may be one of them. This film is directed by Simon Curtis, who has previously directed movies like "My Week With Marilyn" and "Woman in Gold." If you know anything about these two titles, you'll know it's clear that Curtis gravitates towards directing biopics. This latest biography tells the story of A.A. Milne, played by Domhnall Gleeson. The story picks up right after his military service in World War I. It shows how Milne suffered from PTSD because of his experiences during the war. It was Milne's attempt to escape his PTSD that led him to seek refuge in the English countryside to be away from the claustrophobic big city life. After being stuck home alone with his son Billy Moon, aka Christopher Robin, played by Will Tilston, for a few weeks, A. A. Milne was inspired to write his most famous book "Winnie The Pooh" based on his son's adventures with his toys. As we know, this book would go on to thrust Christopher Robin into the spotlight, and in turn, ruin his life. Also in the film is Margot Robbie, who plays Daphne Milne, Christopher's shrewish mother. Daphne has always been disappointed about Billy Moon because she thought she was having a girl, only to discover upon birth that he was a boy. Rounding out the cast is Kelly MacDonald, who plays Christopher's nanny Olive (aka Nou), the closest thing Billy Moon ever had to a real parent. Winnie the Pooh is one of the most iconic children's book characters of all time. Anyone who was born in the last century is likely to be familiar with the character. BigJ and I both grew up watching the newer incarnations of Pooh, his friends, and the Hundred Acre Wood on TV. Needless to say, it's a bit sobering to find out the real Christopher Robin's life was ruined by this beloved character and that his parents were actually quite terrible at being parents. Technically speaking, there's not a whole lot wrong with "Goodbye Christopher Robin." It is certainly a pretty looking picture because, let's face it, what movie with a sprawling English countryside looks terrible? Domhnall Gleeson puts on a good performance as A. A. Milne, and even though Margot Robbie is unlikable as her character Daphne, she still manages to play the part well. Will Tilston is adorable for the majority of the movie though Billy Moon has a tendency to screech when he doesn't get his way. Beyond the acting and presentation, this is a very stodgy British period piece that sadly lacks any real emotional punch. This could be because the final climactic moment is spoiled within the first few minutes of the film. We were hoping this story would something we could resonate with emotionally, but we were very let down by its lack of genuine heart. It is also extremely poorly paced and drags on during certain scenes. It gets boring rather quickly, which is never good a good sign, especially when a movie is already stuffy. 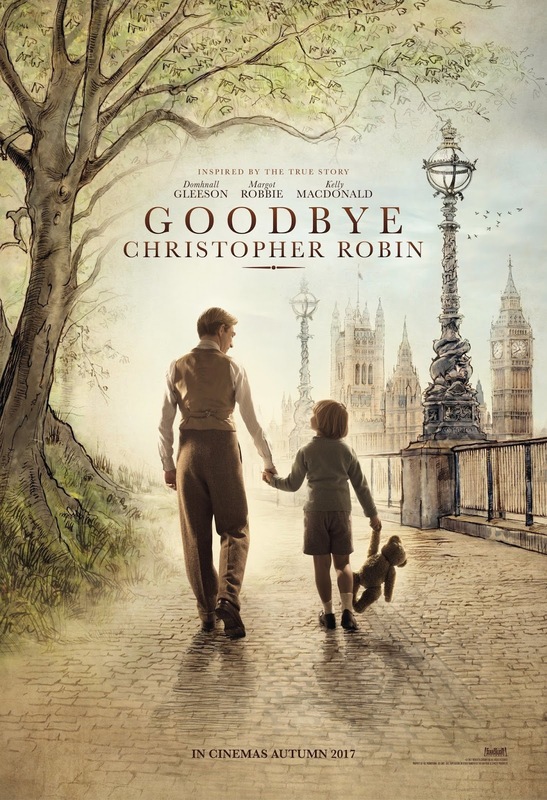 Overall, "Goodbye Christopher Robin" does have an occasional good moment and is led by three good performances by Gleeson, Robbie, and MacDonald, but we were left very disappointed by how miserable the story really was. There's nothing left to say except tinkety tonk. **Did you know we have a podcast? Check out the episode where we discuss "Goodbye Christopher Robin" right here! Our review starts at 37:29!